I have heard a lot about this book. It really sounds good in may ways. I liked the quote that you closed with. Thanks, Brian. Glad you like that final quote. It’s an excellent book, very atmospheric. Quite different to Cassandra in some ways, more traditional in its approach to storytelling. Oddly enough, I have this winging its way to me from an online seller – and I can’t think what triggered my ordering it. But I’m very much looking forward to it now! What a coincidence – you have a treat in store! I can’t recall if you’ve read Cassandra, but I hope you enjoy this one. Oh this sounds wonderful. I have been meaning to read Dorothy Baker for ages. She’s great. I love the mood and atmosphere in this one – it feels steeped in the period. I have wondered what people with, as sad as it sounds, no interest in jazz, will get out of this book. A lot, I hope. But I have doubts. I had no idea Beiderbecke’s given name was Leon. I would hope they’d get a lot out of it too, there’s a great story here. The jazz element is important, but the themes of harnessing a talent and the single-minded pursuit of a passion could apply to other forms of music or other endeavours (sport, for example?). I loved the relationship between Rick and Smoke, the way music can break down the barriers between people of different races. ‘Leon’ was news to me too – I’d always thought of Beiderbecke as ‘Bix’! 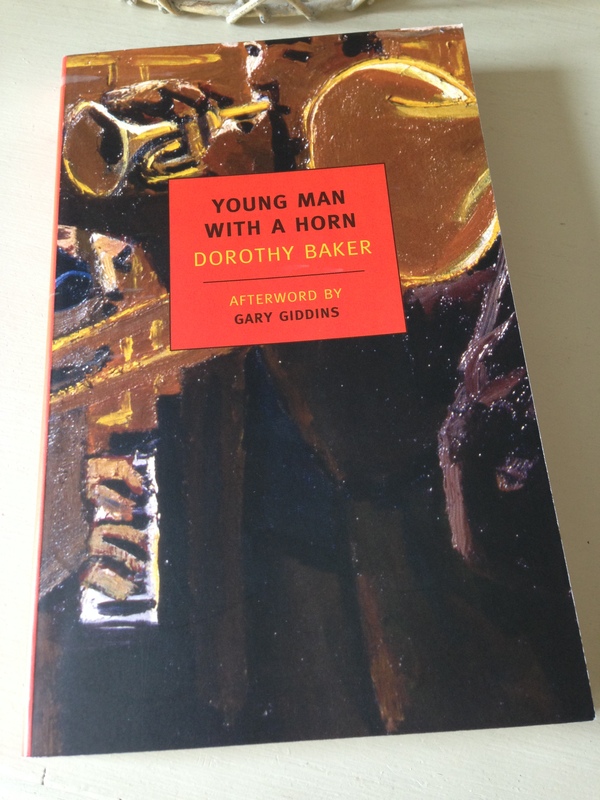 I think ‘Young Man with A Horn’ has been somewhat unfairly dismissed because it was a best seller and made into an extremely popular movie I have also read Baker’s ‘Cassandra at the Wedding’ and ‘Trio’ which is the novel that got her into trouble. Here is my review of Trio. I thought Young Man with a Horn was very fine indeed, rather different to Cassandra but superbly written all the same. Glad to hear you rate it too. I’ll head over to yours in a little while to read your review of Trio – the mere fact that Raymond Chandler loved the novel and wanted to turn it into a film has piqued my interest! Thanks for the link. I am not a great fan of much contemporary jazz but I adore this era and the music. Such a rich context for a novel and this sounds wonderful. I really must dive into more NYRB Classics. My favourite indie store carries a vast selection but they are all spined and colour coded. Makes browsing more challenging! Yes, it’s a very evocative era, isn’t it? Baker really gets the period and mood here. (Well, I’ve no way of telling for sure, but it certainly feels very authentic!) The passionate but troubled musician is such an absorbing subject for a novel…it didn’t want this one to end. It’s good old traditional storytelling, but Baker’s prose is superb. I’m glad this didn’t disappoint, Successful novels about musicians are relatively thin on the ground despite (as you say above) being a great way to explore talent and creativity. It definitely lived up to expectations, Grant. I loved the themes, and the relationships between the musicians are beautifully rendered. Do you think you’ll read it at some point? I spotted this in the library a while ago and I wasn’t sure if I should pick it up – you’ve convinced me that I should when I see it next. Hurrah! I hope you manage to pick it up during a future visit. I think you’d like Dorothy Baker’s style. Lovely review! I’ve had Cassandra and this on my shelves for ages, but never quite got around to reading them – but you have convinced me to pick them up. And that NYRB edition is such a beauty; I have an old hardback, which is very plain in comparison. Thanks, Simon! Dorothy Baker’s great – I can’t recommend these two novels highly enough. Hope you enjoy. The NYRB Classics editions are lovely, but there’s something rather attractive about owning a seasoned hardback edition. I have a reading friend who loved this, and since our tastes are similar I think I’d enjoy it too–plus I always give releases from NYRB a close look. Oh, excellent – I think this would be a good bet for you, Guy. There’s a film adaptation with Kirk Douglas, Lauren Bacall and Hoagy Carmichael – not sure if it’s any good, but it might be worth a look. I’m hoping NYRB might reissue Dorothy Baker’s Trio at some point just to extend the set. Well, I’m a fan of Beiderbecke and I loved Cassandra so it won’t surprise you that this is already on my TBR. I thought I owned a copy until recently in fact, though it turns out not, so it’s one for the post #TBR20 pile for sure. As you say, hopefully they’ll release Trio again too so we have the trio. Thanks, Max. Hurrah – this should be a banker for you, then! It’s a little different to Cassandra, good old-fashioned storytelling in a way, but Baker’s prose is top drawer. I think it’ll make my end-of-year highlights. I really do hope NYRB republish Trio at some point as Raymond Chandler had his eye on it for a screen adaptation. It never came off, sadly. Still, I’m sufficiently interested to try and track it down. There’s nothing wrong with a good story well told. For all my love of Modernism and experimental fiction and whatever that still remains a powerful thing. Exactly. Sometimes you just want that. The storyline and main characters (with the possible exception of Amy) really hold it together here. I have just had my eyes opened to the wonders of the nyrb classics (by reading Alberto Moravia’s Contempt). It sounds like this one is every bit as fascinating in its layers and study of the individual. I love the NYRB Classics range – they always seem to have something interesting to offer. (I don’t know who curates their selection, but whoever it is, they’re doing a damn fine job.) This is the second Dorothy Baker I’ve read, and while they’re very different novels, both focus on complex, troubled characters. I’ve been intrigued by the reviews of Moravia’s Contempt and its focus on the psychological. The Boredom readalong is very tempting, but I’m trying to read from my TBR at the moment, and I don’t have a copy. Ah, well…I’ll certainly keep an eye out for your review, though. Moravia’s Agostino is next on my ‘write-up’ pile, so my review should be up next week (if you’re interested). I thought it was excellent, so I’m sure I’ll pick up another Moravia at some stage once the TBR pile is a little more under control! I love those quotes. I’m going to explore Dorothy Baker and add her to my wishlist. I’m so glad NYRB republished these novels. She’s such a great writer when it comes to character, mood and ambiance – well worth exploring! Loved Young Man with a Horn, Seamus. I hope you have a copy – if so, you have a real treat in store. It’s wonderfully evocative, a great novel for a sultry summer’s evening. Thanks for the link to the Ondaatje – not one I’m familiar with so I’ll head over to yours to check it out! Great writeup, Jacqui! I’ve had the 1950 Michael Curtiz in my sights for coverage for quite some time now. I really must try to get round to it soon. And I must now (j’accuse!) try to track down the novel, too. Thanks for this very thoughtful review. It goes on the virtual TBR. I like jazz music even if I have trouble remembering the musicians’ names. Have you read Novecento by Alessandro Barrico? I haven’t, I’ve seen the play version and this reminded me of it. Thanks, Emma. I loved this one – it just seemed to capture a particular time, place and lifestyle so well. I haven’t even heard of Novecento! I shall have to investigate. There’s a film adaptation of Young Man with a Horn, but I’ve no idea whether it’s any good or not. Baker writes great dialogue, though – I could see this one and Cassandra working well on the stage. I’m staring to become eager to read Baker. That description of the jazz being played in the Cotton Club is marvelous. And I thought of Chandler in that quotation about Rick meeting Amy before you even mentioned him! Isn’t it just? Baker’s so on good at capturing both the dedication of the musicians and the rhythm of their music. There are several great passages just like the one I quoted in my review. That description of Rick meeting Amy is so Chandler-esq, isn’t it? Interestingly, the afterword in the NYRB Classics edition mentions that Chandler wanted to turn another of Dorothy Baker’s novels (Trio) into a film. Sadly it didn’t come off, but he must have been a fan of her writing. What more can I say…I can only encourage you to hop to it on Dorothy Baker! Cassandra is my fave of the two (an absolutely brilliant novel), but Young Man with a Horn is very fine indeed. I had no idea Chandler was a fan – and that he wanted to make a film of one of Baker’s books! That I would have dragged myself out of the house to see. Anyway, very much looking forward to getting to know Baker’s work. “Raymond Chandler loved Trio, and implored Paramount Pictures to buy it for him, boasting to a friend that when he got done, no one would know there were any lesbians in it. What a tantalising prospect that film would have been! I’m quite keen to get hold of a copy of Trio, but it’s out of print and copies are rather scarce. One to look out for in the second-hand bookshops. Anyway, I think you’ll love Dorothy Baker – you must read her, Scott! What a story! Sounds like high time some one resurrected the novel and the Broadway play (?!). I’m clearing some space on the night table for Baker’s books, as I expect that once I start I’m going to plunge right in. Definitely – I’m hoping NYRB might publish Trio, especially given the interest in Cassandra and Young Man. And it would complete the set rather nicely. I can imagine these books working really well on the stage – she’s so hot on dialogue. Start clearing that space on your night table as Baker is very addictive! Thanks for alerting me to this, Jacqui (I’ve seen the date on your review now and realised why I missed it before). It sounds exactly like something I’d love; I really like the quotations you’ve selected, I love it when a writer can go some way to capturing the essence of music, it’s not an easy thing to do. You’ve also reminded me that I need to read Cassandra at the Wedding. I bought a copy after you reviewed it. I’ll add both to the pile for after Christmas.